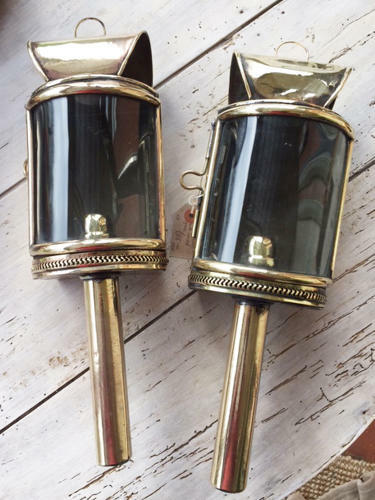 Superb Pair of Brass Cart Lamps with bow fronted glass windows (both intact!). Hinged doors with catches complete. Pierced decorative base and loop hangers at top. Both take candles which are sprung fed from the base. Lovely to find such a classic pair of original lamps in good condition. Note top of one lamp looks crushed in pic - that is not so it is just the light reflecting.